Our single eye cable sock range is part of the light to medium duty cable grip line up here at Rope Services Direct. It is a great all purpose option for positioning cables and is available in a number of sizes. You can choose single cable socks made with galvanized steel or stainless steel, both of which will offer a good amount of corrosion resistance. The stainless steel socks have a lower minimum breaking load rating on average, which is worth bearing in mind. Limits range from 610kg to just over 7 tonnes. To talk to the Rope Services Direct team about wire rope socks, or to place an order, just call 01384 78004 or fill out our response form. 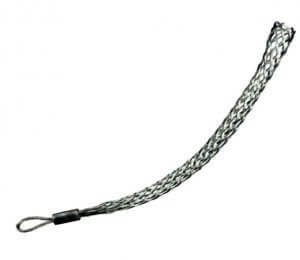 Our quotes are competitive and our wire rope products are second to none in terms of quality. Single Eye Cable Sock Overall rating: 5 out of 5 based on 6 reviews.